The borders are moving. 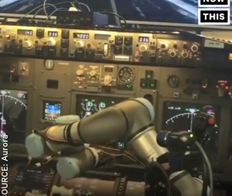 Robot is learning to fly a plane and landed it from 3,000 miles during a simulated test using a real cockpit. This was the first time that robot's flying with "Big birds". It wouldn't be surprising to see the robot as a second pilot very soon. Great achievement. It would be breakthrough in aviation technology as well as space. This is so scary, picture reminds of Airplane (the movie satire). Why on the Earth would one put an industrial robot arm in a modern airplane?